Came across this in archive of LSE student magazine, The Beaver, 9 December 1991. 'Baby Lemonade' reviews a gig at the New Cross Venue by Spiritualized - 'a band for the post rave 90s' no less'. The bands at the Venue at this time were only part of the night out, as the author notes: 'The night wasn't over there though. The post show club featured sounds as diverse as New Model Army and the Shamen. Trendy spot it must be too, as at one point I found myself dancing on the heels of Mikki from Lush' (see previous post on Lush at The Venue). 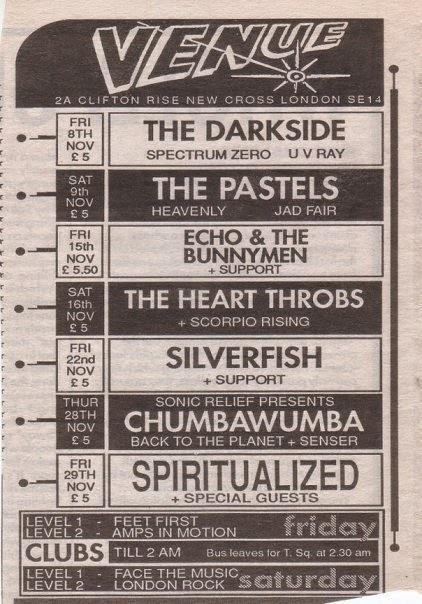 I loved The Venue when I first moved to London in 1994.